V H Sesank (right-most) interned with ICICI Prudential and recollects his learning experience from his internship. Sesank is an MBA student at TA Pai Management Institute. Read on to discover more about his internship story. I personally think you need to be open minded and be ready to learn whatever comes your way. If you have pre-conceived notions that the organization should be like this, the work culture should be like that, the moment you find deviation from the expectations, you get demotivated to your work. I joined ICICI Prudential with an open mind. I can vouch that not many companies would have given such a brilliant internship experience as ICICI Prudential has given me. The internship was for 8 weeks starting from April 14th 2014 to June 14th 2014. 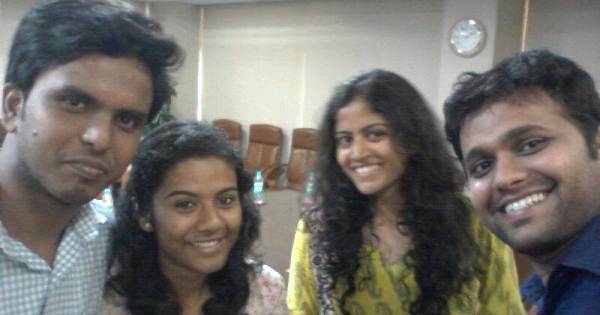 Our internship started in Mumbai, we had a one week induction program over there. This induction program made a lot of difference it has actually proved how much IPru (as the employees of ICICI Prudential fondly call it) takes care of the interns because it did not jump into giving the projects to the students as soon as they joined. It was well planned and a structured one. We were taught about how insurance came into existence, why does one need insurance, what are the awareness levels about insurance in India compared to USA or per se any other country, What is the current penetration level in insurance sector, what the potential for private players, what are the general POD’s etc. I personally think this induction program added lot of value to me and gave a great push to start because coming from a IT sector with 30 months experience what would I do if I was put in work on day 1. Even a minimal one or two day induction would also not solve the purpose because I was completely novice to this insurance industry. We had a 6 day induction where each day we had sessions on the risks involved, under writing process, compliances to be followed etc. As the induction was in Mumbai Head Office we had the privilege of interacting with very experienced people in IPru, some of them were from the time of its inception in 2000. The learning from them was phenomenal. The hospitality they provided was wonderful, I bet even my mother would not have fed me so punctually from morning breakfast @ 9 AM to snacks at 11am to special Lunch with that days‘ speakers in our induction program at 2pm and to conclude with snacks at 4 pm. After the induction I was posted to Banglore location there I got to work under two visionaries in ICICI Prudential who have carved a place for themselves in IPru, one was the President and the other was the Vice President of ICICI Prudential Banglore region. I was assigned to work under the Vice President of Banglore region. He is in a post where he has many issues to look into day in and day out. Despite being in such a position, when I was introduced to him as an intern from TAPMI he looked at me for a moment and said “I remember you, you are the same boy whom I interviewed in the video conference right? You said your long term goal is to have a fast career growth and reach strategic roles faster right?” I was awe struck by his memory and was just nodding which meant “Yes”. He said, “You are in the field now, let me see how passionate you are about your goal”. Those words still ring in my years and motivate me towards my goal. My second week in internship i.e. the first week in Bangalore office was spent in understanding how the business takes place and correlating to what was taught in induction process. By the end of the week I was assigned the project to do post sale service analysis of the services offered to HNI customers of I-Pru and come up with implementable recommendations. If the third week has gone in doing secondary research the fourth week has gone in taking in-depth personal interviews with ICICI Prudential employees and its competitors’ employees to know the service related issues faced by the customers. From these inputs I made a questionnaire and hit the field for the next three weeks. I had to fix an appointment with a HNI, go meet him and take an interview. Coming from a software back ground where I used to sit and code meeting people, taking interviews, traveling in that scorching heat, in those packed city buses, in that everlasting traffic jams was fun in the start but as the time passed by it became challenging. This reminded me of what I was told when I joined MBA, “You should come out of your comfort zone to learn new things.” I pushed myself beyond my capabilities as my work required traveling close to 30 kilometers in a day to take personal interviews from High Net Worth Customers. As the days passed by I could see the change in my approach towards the customers, the way I talk, the way I analyze them and document the findings. It was more realistic and logical. By the end of seventh week with the responses I collected from HNI’s I started making report. I have made a study on the kind of services which the company is offering, the market is offering and customers expect. I was able to identify the need gap. Made a list of recommendations and for each recommendation made a detailed study on the feasibility, possibility, tractability of the recommendations. The precipitate was a few very good “implementable” recommendations which I presented to my mentor the Vice President of Banglore region on 14th June 2014 and bid adieu to I-Pru. 1. Punctuality – Do work in time or before time but never be late. 2. Pro-activeness – You be the first person to take the initiative. 3. Passion – Though you are new to the field do it with complete commitment and passion. There is an enormous amount of learning which I have got in these two months. I am completely satisfied with the work given to me by the company, its work culture and the way I was guided through. I can say confidently with a hand on my heart I have done a perfect Summer Internship and ICICI Prudential is probably one of the few companies which has given such an enriching and learning experience to an intern. I love my internship experience and I suggest everyone to take up their internship seriously and make the most out of it. If Sesank‘s experience motivates you, you can view the latest internship in Mumbai. Editor’s note- Have you got an internship story to share? A chance to win cool Internshala T and other cash prizes by participating in Your Internship Story Contest. Made a difference in someone’s life! Good job Sheshank. It shows your sincerity and commitment towards the internship, instead of doing it as mere ritual. Good work Seshank, especially for bringing out the critical areas of learning. A motivating experience. 4P’s gave a good push up.. All d best !! !